Although the basic theories of thermodynamics are adequately covered by a number of existing texts, there is little literature that addresses more advanced topics. In this comprehensive work the author redresses this balance, drawing on his twenty-five years of experience of teaching thermodynamics at undergraduate and postgraduate level, to produce a definitive text to cover thoroughly, advanced syllabuses. The book introduces the basic concepts which apply over the whole range of new technologies, considering: a new approach to cycles, enabling their irreversibility to be taken into account; a detailed study of combustion to show how the chemical energy in a fuel is converted into thermal energy and emissions; an analysis of fuel cells to give an understanding of the direct conversion of chemical energy to electrical power; a detailed study of property relationships to enable more sophisticated analyses to be made of both high and low temperature plant and irreversible thermodynamics, whose principles might hold a key to new ways of efficiently covering energy to power (e.g. solar energy, fuel cells). Worked examples are included in most of the chapters, followed by exercises with solutions. 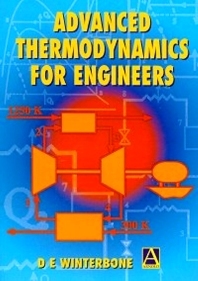 By developing thermodynamics from an explicitly equilibrium perspective, showing how all systems attempt to reach a state of equilibrium, and the effects of these systems when they cannot, the result is an unparalleled insight into the more advanced considerations when converting any form of energy into power, that will prove invaluable to students and professional engineers of all disciplines. Senior undergraduate/postgraduate mechanical engineers and dedicated MSc thermodynamic courses. Chemical, manufacturing and aeronautical engineering. Preface Structure Notation State of equilibrium Availability and exergy Pinch technology Rational efficiency Efficiency of an internally reversible heat engine when producing maximum work output Relationship between properties Equations of state Liquefaction of gases Thermodynamic properties of ideal gases and ideal gas mixtures of constant composition Thermodynamics of combustion Chemistry of combustion Chemical equilibrium and dissociation Effect of dissociation on combustion parameters Chemical kinetics Combustion and flames Irreversible thermodynamics * Fuel cells.